It is almost as if the Mass Effect game read my former post about missing Wrex and anticipated on that. Creepy. Wrex is apparently still busy on his homeplanet sorting out who-knows-what, so my employer Cerberus sent me off to a planet to collect a substitute Krogan (picture above). Stuff started out the old fashioned way when the planet appeared to be inhabited by crazy mindless Krogan that attacked upon sight. After fighting through these, I found the Krogan I was supposed to be recruiting: a mad scientist that was trying to breed 'the perfect Krogan'. He worked with clones and genetic modification and tried to indoctrinate his subjects with emotions and commands before waking them up. All cloned super-Krogans that were not good enough were set loose to fight mercenaries in some sort of sick minded merc-training program on the planet's surface. And I am supposed to recruit this guy? I understand there are different ethics widespread in Shepard's galaxy, but I'm still a 21st century girl from Amsterdam making the decisions here. Thanks, Cerberus, but no. Not gonna happen. 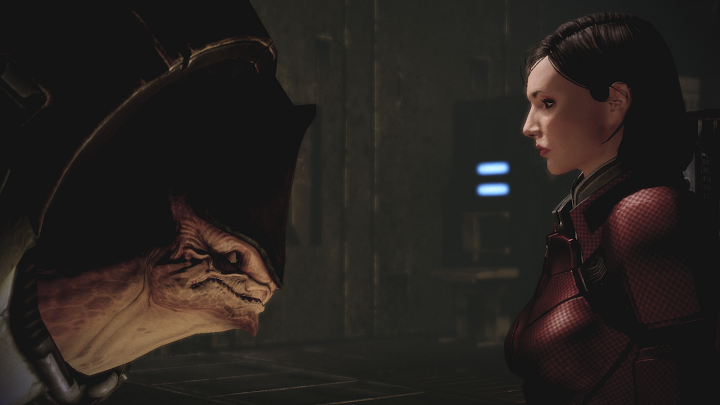 At this point the Mass Effect game was being creepy again by reading my mind and letting the crazy Krogan get killed by his employer, who was pissed off by all the Krogan that had been killed by my hand. I can see a point there. I mean, sure, I would've wanted to call, set an appointment beforehand and not having to fight all those mental Krogan as well, but the game didn't let me. I guess it's not proper 22th century etiquette to knock before entering. Sigh. Anyway, just before he died, the mad Krogan scientist asked me to take his latest super-Krogan clone with me and take care of it. And of course my natural talent to do things that sound like a ad idea (think: Rachni-queen) popped up: I took the frozen super-Krogan with me to the Normandy. The super-Krogan was pink with lilac of colour with light blue eyes. This should have warned me that there was something ominous about this one. A pink Krogan... it just doesn't feel right. 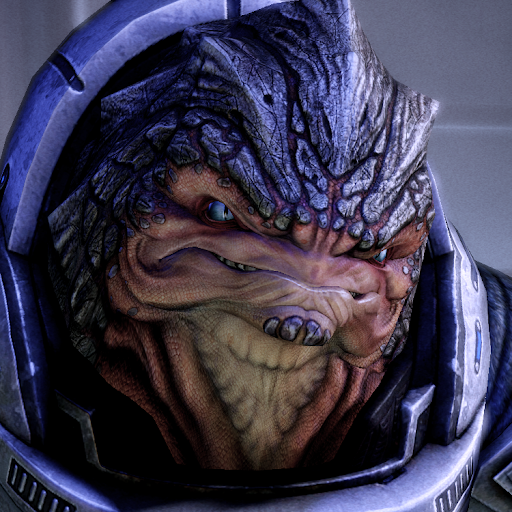 What exactly had the crazy Krogan in mind when he thought of 'the perfect Krogan'? Of course the first thing he did when I awoke him on my ship was to try to rip my head off. I needed to remind him of in what what position he was to get him back in line. After that he gave himself the most charming name "Grunt". Great. BioWare, if you are listening: please give me Wrex back! i take ur not going to follow me anymore. that is completly understandable.